Avalokiteśvara, “Lord who looks down”, is a bodhisattva who embodies the compassion of all Buddhas. 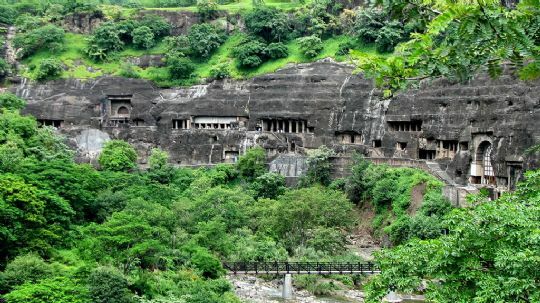 The Ajanta caves are located in the western Indian state of Maharashta, cut into the cliff face above the spot where the river Waghora draws a harmonious half-moon through lush vegetation. Discovered by English officers during a tiger hunt in 1819, the caves are in such a remote spot (the nearest towns are Jalgaon and Bhusawal, 60 and 70 kms away respectively) that it was only in 1983 that they were declared a UNESCO World Heritage site. The English officers named the caves after the nearby village of Ajinṭhā. Some sixty miles away the caves have a sister site – the Ellora caves – which house 34 rock-cut Buddhist, Hindu and Jain temples. However the Ajanta caves predate those at Ellora by 600 years, and are a testimony to the golden age of Buddhism in India. Chiselled out of the living rock over a period that runs from the turn of the II century BC to the V or VI century AD, these artificial caves open up onto the cavea of an immense natural theatre created by the horseshoe bend in the Waghora River. Access to the caves was originally via ladders or steep staicases cut into the cliff which led up from the river to the cave openings. Today, they can be easily reached via a walkway that runs across the cliff face. There are twenty-nine caves, the majority of which were Viharas, (Buddhist monastery halls of residence) with five Chaitya-grihas (stupa halls) containing Buddhist shrines, an ideal place for meditation in silence and semi-darkness. The Viharas, usually rectangular in shape, were used for prayer and daily living, with small cubical sleeping cells for the monks cut into the walls and a shrine at the far end housing a statue of the Buddha carved into the rock. At the centre of the viharas, lines of columns formed a perimeter around a square, creating a cloister effect At one time these halls of residence were occupied by as many as 200 monks and artisans. The entire site is a single sanctuary dedicated to Buddha and all his majesty is celebrated in the massive columns, the Majestic naves and also the numerous votive reliefs and ornaments. The most splendid feature is the painting cycles and sculpted reliefs which completely cover the caves’ walls and vaults. There is an equilibrium between bright colours and soft lines, sensual images of lovers and images of impeturbable sages. 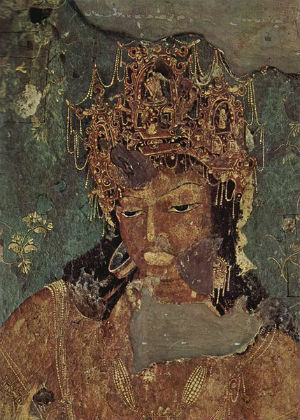 The paintings had a didactic function, imparting to the community the teachings of Buddha and his experiences during his various reincarnations (as recounted in the jataka – the stories of the lives of Buddha). 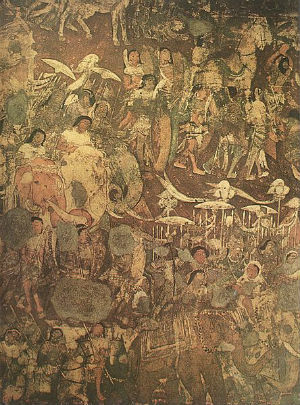 Devotees were supposed to walk through the cave and ‘read the paintings’, which were used as a medium of communicating Buddha’s teachings about ‘life through successive rebirth’. According to one of the inscriptions in Cave 17, the whole complex of sculptures and wall paintings were designed to “cause the attainment of well-being by good people as long as the sun dispels darkness by its rays”. Neverheless, the definition of “good people” was not limited to devoted ascetics and these halls of meditation could also be frequented by aristocrats who had embraced Buddhism. The Ajanta wall paintings are famous for their masterful line-work, the use of natural pigments, the artistry achieved with only primitive tools, the sensual forms, and the harmony of the overall composition. The end result, we must remember, would have been viewed in semi-darkness with perhaps just some weak oil lamps to help make out the figures. 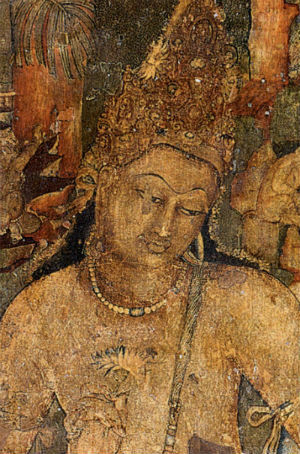 These masterpieces at Ajanta were executed more or less in two phases. An initial phase is made up primarily of the fragments in caves 9 & 10, from the second century B.C. The second phase of paintings started around V and VI centuries A.D. and continued for the next two centuries. There appear to have been a multitude of artists at work and both the style and quality are varied. It is in this second phase that we find the depictions of the jataka – the stories that recount the lives of Buddha. Renowned worldwide for their exquisite beauty, the various Bodhisattvas depicted in Cave 1 include Vajrapani (protector and guide, a symbol of Buddha’s power), Manjusri (manifestation of Buddha’s wisdom) and Avalokitesvara (symbol of Buddha’s compassion). The ceiling decoration invariably consists of decorative patterns, geometrical as well as floral. 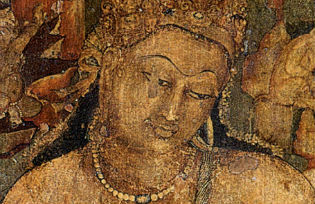 The highly accurate pictorial technique used in Ajanta and the method of execution makes these wall paintings unique in the world. For many years these pictures were called frescoes, but this is an erroneous term in this case, and they are now referred to as murales, due to the fact that they were painted on a dry surface. A layer of clay was mixed with cow dung and powdered rice hunk and, it has been suggested, also urine. This was first applied to the chipped rock surface. When it dried, a second coat of lime plaster was applied with a trowel. The lines of the image were then drawn in pink, brown or black, and the colours filled in with big brushes, made from the hair of squirrel tails. These colours were made from pebbles and vegetables found on the nearby hillside which were crushed and ground and then mixed with glue. The main colours used were red ochre, yellow ochre, brown ochre, lamp black, white and lapis lazuli which was imported from Northern India, central Asia and Persia. The green was made by mixing this lapis lazuli with Indian yellow ochre. In the pictorial cycles, all the characters are bright and multi-coloured but are never repeated, a fundamental concept in Indian art. Ceilings, walls and pilasters are all covered with overlapping figures, brought to life by the artists with strong and contrasting colours. The paintings are meant to transmit a rythmic equilibrium indicating the harmony of a society in which the smallest gestures and desires have a specific place in a vision of the world that is much larger and devoid of disquiet. These wonderful murales, miraculously still intact thanks to the many centuries during which the caves remained undiscovered, are the only surviving examples of Indian art of ancient Buddhist India. The majority of these murales are over 1,500 years old. It is extraordinary to think that ten centuries before the European Renaissance, these anonymous artists already knew the principles of perspective depth and realism in their art. The expressions and the emotions captured on the faces of the characters are amazingly real and modern.